The Bush administration publicly pretends disinterest in polls, while privately spending millions on them. Unlike other recent administrations, the Bushies do not use polls to determine what the public would like, they use them to discover how best to sell what they've already decided to do anyway. Green characterizes the latter as "arguably a much more cynical undertaking" than using polls to craft popular policies. His reporting suggests that whenever the Bush administration apparently changes policy, the prudent observer will inquire whether the change is real or merely rhetorical. There's a disturbing parallel between an administration that spends millions on polls to select the most popular rhetoric with which to market its (presumably otherwise unpopular) policies, and the recent revelations by David Brock that a "handful of wealthy fanatics -- men like the Rev. Sun Myung Moon, whose cultlike Unification Church owns The Washington Times, and Richard Mellon Scaife" -- bankrolled various right-wing enterprises including The American Spectator. The so-called Arkansas project, which tried among its fabrications to tie the Clintons to the death of Vince Foster, was run from the Spectator's offices. Scaife's group succeeded in turning what was a $200,000 bad investment -- Whitewater -- into what Paul Krugman calls a "byword for scandal." A $73 million investigation failed to uncover any evidence of wrongdoing by the Clintons. Key figures from the Scaife operation are now members of the Bush administration, however, perhaps most notably Theodore Olson, now the Solicitor General. A complicit and complacent media plays a major role in facilitating these propaganda operations. Recent prime examples are stories about Clinton staffers vandalizing the White House, and Kenneth Lay staying at the Clinton White House, both of which were bogus. Columnist Paul Krugman, whose writings are frequently critical of the Bush administration, revealed recently that he had been the victim of a smear campaign. A noted economist, Krugman did some consulting for Enron during the time he was a college professor (and not a columnist). "Right-wing sources" opined to their media contacts that what had been an ordinary consulting job was somehow corrupt. The implication was that since Mr. Krugman "took money" from Enron, it was hypocritical of him to criticize "crony capitalism." The administration's handling of the annual Social Security trustees' report is another example of trying to use rhetoric to hide an unpopular policy. Social Security is a popular government program; the Bush administration is opposed to it on principle, so has tried to declare it dead. Normally the trustees' report is released in the morning, and simultaneously posted on the web, so that journalists can read and analyze before filing their stories. This year the first copies were delivered in the late afternoon, allowing no time for analysis. The reason for the somewhat lame attempt at hiding the report's conclusions: Social Security is actually in good shape. The administration would like to promote the view that last year's tax cut will have no significant effect on longterm government finances, while Social Security is in a crisis. The opposite is true. Social Security appears to be solvent for at least 40 years. But like all propagandists, the administration and its mentors at the Heritage Foundation view reality through the lens of ideology. The Heritage Foundation sees every progressive initiative since the New Deal as "an assault on founding principles articulated in the 18th century." Not coincidentally The Heritage Foundation was founded with funds from Richard Mellon Scaife and others in the same right wing group that bankrolled the Arkansas Project. Fortunately the public is not always deceived, at least when it comes to Social Security. A USA Today/CNN/Gallup Poll conducted at the end of March found that fewer than half of those surveyed approved of Bush's approach to Social Security or campaign finance reform. On Social Security Bush's poorest showing was among people 65 or older who worry that their benefits will be reduced if younger workers are allowed to make private investments with a portion of their payroll taxes as the administration proposes. Democratic pollster Stan Greenberg suggested to USA Today that Democrats running for office this year should refer to the Bush tax cut as "a raid on Social Security." Bush also scored below 50% for his handling of the abortion issue -- not surprising, since one of his early executive orders was to stop the use of U.S. foreign aid to support organizations that provide abortion or abortion counseling. On health care policy Bush scored only slightly above 50%. Pointing out that the Bush prescription drug plan "leaves 60% of seniors with no coverage at all," Greenberg suggests that backing a more comprehensive plan may help Democrats gain in the upcoming elections, as well. A CBS News poll published April 3 showed substantial decline in public approval for Bush's conduct of Middle East policy compared to his so-called war on terrorism. Less than half of those surveyed said Bush had the experience necessary to negotiate a peace settlement. As Ron Fournier of the Associated Press wrote, Bush "looked unusually indecisive and vulnerable to criticism that his actions -- and inaction -- have handicapped peacemaking efforts." Anti-American demonstrators clashed with security forces throughout the Islamic world, including Lebanon. Turkey, Egypt, and Jordan -- moderate nations whose support would be essential to any military campaign against Iraq -- questioned Bush's inaction in the face of escalating violence in Palestine. The European Union proposed that a new international alliance mediate a ceasefire in the wake of ineffective U.S. efforts. It is perhaps inevitable that an administration more concerned with the popularity of its rhetoric than its policies makes conflicting statements. Shortly after September 11 Bush announced his simplistic formulation that a country that harbors terrorists would be dealt with as terrorists. Besides the fact, noted by some, that the U.S. itself might fall into that category, Bush soon declared that Palestine had to be considered a special case. Two weeks ago the administration called Israel's military advances into Ramallah and Palestinian-controlled areas of the West Bank "not helpful." Then on March 30th Bush essentially endorsed new attacks in Ramallah, while at the same time the U.S. was supporting a U.N. resolution calling for troops to be withdrawn. Bush's declaration during his state of the union address that Iraq, Iran, and North Korea constituted an "axis of evil" alarmed allies and Muslim nations alike. Good will built up over years of careful negotiations in the Middle East began to wane, perhaps culminating in the statement issued at the recent Arab League summit in Beirut that they rejected "the threat of an aggression on some Arab countries, particularly Iraq, and assert the categorical rejection of attacking Iraq or threatening the security and safety of any Arab state, and consider it a threat to the national security of all the Arab states." The statement came on the same day as the League's unprecedented endorsement of a peace proposal, which included calls for the normalization of relations with Israel, and for Israel to return to the Palestinians territory seized in the 1967 war. In the context of the Washington Monthly's revelations, one could go so far as to assume that the administration's public statements never actually reflect policy, but are rather indications of what the administration would like the public perception of an undisclosed policy to be. That might explain some of the administration's fierce resistance to releasing information about the Cheney Task Force meetings that led to the development of energy policy. But particularly in the case of foreign policy concerning the Middle East, it also raises the question of what the administration policy actually is, and what factors (if any) inform it. In the case of George W. Bush himself, and probably Attorney General John Ashcroft, as well, a clue may be found in their adherence to fundamentalist, evangelical Christianity. Molly Ivins has written about Bush's "personal salvation" in Shrub, her amusing and critical biography of "the short but happy political life of George W. Bush." Dubya's first encounter with evangelical Christianity as an adult was likely during the summer of 1985. Dubya was spending a part of the summer at his family home in Kennebunkport, ME, and met with the popular evangelist Revered Billy Graham. As the story goes, Graham asked Bush if he was "right with God," Bush said "he wasn't sure, and began to think about it." The following year he woke up with a hangover after his fortieth birthday celebration, "quit drinking cold turkey,&quot and "got involved in Bible study groups." The term "evangelical" originally referred simply to the gospel, i.e. the New Testament. In contemporary English usage, however, it is now used primarily to refer to Christian religious groups that trace their origin to a series of revivals that took place in the 18th and 19th century in North America. Since the middle of the 20th century, the term "fundamentalist" has referred to an aggressive style of Protestantism that emphasizes separation from cultural decadence and liberal theology. The fundamentalist movement is heir to the belief system that led to the 1925 trial of a substitute biology teacher for teaching evolution, which "discredited the movement in the eyes of the intellectual and media elites." After the [Civil] [W]ar, the changes in American society wrought by such powerful forces as urbanization and industrialization, along with new intellectual and theological developments began to diminish the power of evangelicalism within American culture. Likewise, this evangelical superiority was diminished in pure numeric terms with the influx of millions of non-Protestant immigrants in the latter 19th and early 20th-centuries. Nonetheless, evangelical Protestantism remained a powerful presence within American culture .... Going into the 20th-century evangelicalism still held the status of an American "folk religion" in many sectors of the United States—particularly the South. Rebellion among the people of Israel. Widespread abandonment of faith (apostasy). A key component of Darby's views was the "postponement theory." Postponement theory viewed God as having turned away from the Israel that rejected the Messiah, to "create, build, and then miraculously evacuate (or 'rapture') the church immediately before the Great Tribulation." Then God would turn back to Israel and the event of the "last days" would unfold, including the coming of the Antichrist, the battle of Armageddon, the Second Coming, and the establishment of the Kingdom of God. Dubya's spiritual mentor, Billy Graham, is among the prominent evangelists including Pat Robertson, Jerry Falwell, and D.L. Moody (founder of the Moody Bible Institute), who have advocated this doctrine. According to ISAE, its popularity has increased during times of national crisis. And to dispensationalists, the rise of the Zionist movement, the creation of the state of Israel, and the capture of Jerusalem during the Six Day War have "excited speculation about the imminent 'rapture' of the saints." When Israel captured Jerusalem in the 1967 war; dispensationalists were certain that the end was near. L. Nelson Bell, Billy Graham's father-in-law and editor of Christianity Today, wrote: "That for the first time in more than 2,000 years Jerusalem is now completely in the hands of the Jews gives the student of the Bible a thrill and a renewed faith in the accuracy and validity of the Bible." On a political level, links between the conservative Likud party in Israel and the "religious right" in the U.S. date back at least to the administrations of Menachem Begin, and Ronald Reagan and Jimmy Carter. The 1967 occupation of Arab lands created tension between some Jewish organizations and many mainstream Christian denominations, including Catholic and Eastern Orthodox churches. Lobbying groups such as the American Israel Public Affairs Committee (AIPAC) looked to the evangelical community for support. AIPAC added staff to target evangelical and fundamentalist Christians, and the Israel department of tourism developed marketing campaigns targeting them for Holy Land tours. Two months after Carter's March 1977 statement in support of Palestinian rights, the Likud party came to power in Israel. Immediately they went to work separating Carter from his evangelical and fundamentalist Christian political supporters, and building opposition to an upcoming U.N. sponsored Middle East Peace Conference. Full-page advertisements in major U.S. newspapers proclaimed, "The time has come for evangelical Christians to affirm their belief in biblical prophecy and Israel's divine right to the land.... We affirm as evangelicals our belief in the promised land to the Jewish people.... We would view with grave concern any effort to carve out of the Jewish homeland another nation or political entity." The ad was signed by a number of prominent dispensationalists, and was one of the first clear indicators of an alliance between the Likud and the evangelicals. Evangelicals and the pro-Israel lobby supported Reagan in the 1980 election. The shift of evangelical voters to Reagan was a significant factor in Carter's loss. In 1982 when Israel decided to invade Lebanon, Ariel Sharon, then Defense Minister in the Begin administration, was sent to Washington to enlist the administration's support. When the invasion began in June of that year, more full-page ads appeared, this time seeking support for the invasion from the Christian evangelical community. When then prime minister Benjamin Netanyahu visited Washington in January of 1998, his first meeting was not with President Clinton, but with Jerry Falwell and a gathering of more than 1,000 fundamentalist Christians. Some extreme dispensationalists believe that Ariel Sharon is being used by God to fulfill the prophecies of the end time. This belief is apparently based upon little more than Sharon's return to power in the Israeli government after having fallen into disfavor following his association with atrocities during the invasion of Lebanon. "For a just man falleth seven times, and riseth up again: but the wicked shall fall into mischief." (Proverbs 24:16). It's not clear, though, how Bush or other adherents reconcile Christian Zionism with the belief that only Christians will enter the kingdom of heaven. W.A. Criswell, of the First Baptist Church of Dallas once asked publicly, "Does God Almighty hear the prayers of Jews?" and had answered emphatically, "No." A former president of the Southern Baptist Convention, Bailey Smith, is also on record with the assertion that "God does not hear the prayers of the Jews." George Bush recounted an anecdote to New York Times writer Sam Howe Verhoek, in which he was discussing the issue with his mother. 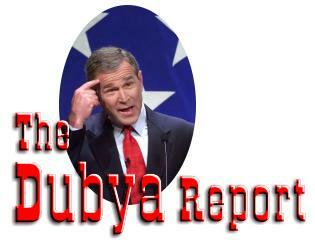 Bush pointed to the Bible saying only Christians had a place in heaven. His mother responded by telephoning Billy Graham to resolve the dispute. As told to Verhoek, Graham said to Bush that he agreed with him "from a personal perspective," but urged him not to "play God." Even this, says Molly Ivins, was spin. Since 1994 the story had followed Bush that he only believed Christians could enter heaven. "So here's Bush five years later, trying to fix the deal," Ivins writes, " using the Sunday supplement of the nation's most prominent newspaper to redefine his position on who gets into heaven...."
Given the dominance of the[e] view with media evangelists, some form of rapture has arguably entered the mainstream of American religion. Some rapture theology teaches that the apocalyptic end of world history is predetermined by God in our time. Consequently, there is nothing we can do to avert it. In this view, peacemaking is both futile and sinful, and all efforts to promote international cooperation are inspired by Satan. Every compromise with our adversaries is viewed as a betrayal of divine trust. Every effort to achieve arms control and to reduce the danger of accidental nuclear wars is a sellout to the demonic powers. Similarly, efforts to deal with pollution or global warming are seen as futile and counterproductive [because the end is near]. While rapture advocates don't wish to promote a holocaust or a global ecological crisis, they are convinced God wills it and thus there is absolutely nothing humans can do to stop these dangers. Jewett's summary is striking in how many of the Bush administration de facto policies -- rhetoric aside -- can be identified. If the unifying principle of Bush administration policies is a set of extremist theological beliefs, it is no wonder that the administration spends millions of dollars on polls to identify appealing rhetoric with which to disguise them. Green, Joshua. "The Other War Room" The Washington Monthly Apr. 2002. Benedetto, Richard and Laurence McQuillan. "Bush rates high in security, lower in health care" USA Today 29 Mar. 2002. "Defining Evangelism" Institute for the Study of American Evangelicals. 12 Oct. 2001. Ivins, Molly and Lou Dubose, Shrub New York: Vintage Books, 2000. Thorkelson, Willmar "Raptured politics" The Lutheran. Dec. 1999. "Ariel Sharon - Lion of God???" EndTimeInfo Dec.1998.